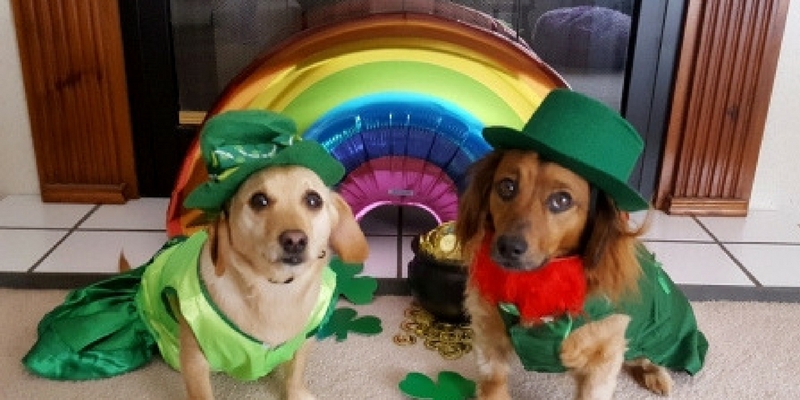 Everyone is Irish on St. Patrick's Day, including these adorable dogs! Here at Modern Dog we love St. Patrick's Day, a day filled with luck, bright emerald clothing, and rainbows! Below are some of our four-legged friends who are just as excited for St. Paddy's as we are! Photos submitted by Modern Dog photocontest participants. Macaroni Sky has an adorable name, and looks perfect in hues of green! Macaroni Sky submitted by Meghan T.
We're loving Scooby's shamrock antenae! Scooby submitted by April S.
Clover has the perfect St. Patrick's Day name because her birthday is on March 17th! Happy Birthday, Clover! Clover submitted by Nancy. Sister and brother Elsa May and Maxwell are picture-perfect with this display of shamrocks, gold coins, and a rainbow! Elsa May and Maxwell submitted by Cindy V.
This little leprechaun is all dressed up for the big day! Farmer submitted by Cara R.
Angus the Miniature Schnauzer looks great in green! Angus submitted by Dana. We're wishing Dexter the French Bulldog the luck of the Irish on St.Patrick's Day! Dexter submitted by Alyssa. Rose may have a flowery name, but for St. Paddy's Day she's all decked out in shamrocks! Rose submitted by Emily. Tia the standard poodle is glowing in green for St. Patrick's Day! Tia submitted by Cristina. Everyone is Irish on St. Patrick's Day, even dogs like Molly! Molly submitted by Tara W.